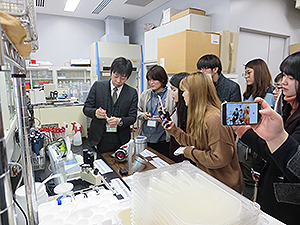 On January 13th, 2017, eight third-year students from Department of Microbial and Nano Materials, Mokwon University in Republic of Korea visited the TNRICP to learn microbial control techniques to preserve cultural properties. They were given an explanatory tour by researchers at the Biological Laboratory and the Performing Arts Studio. 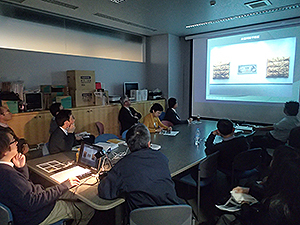 In his presentation, OYAMADA reported actual improvements made on the website of the Tokyo National Research Institute for Cultural Properties. The Institute has been publishing the “Year Book of Japanese Art,”a data book that summarizes trends in the art world in Japan, since 1936. On the other hand, the Institute has also made data accumulated in editing the book, including those on exhibitions and literature, available to the public on the Internet. 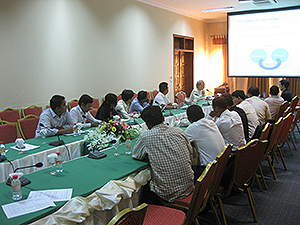 As part of this effort, in April 2014, the Institute published database improved by using WordPress software. The database covers “The Articles on the Deceased,” a compilation of brief descriptions of the deceased who had careers in art, and “The Annals of the Art World,” which summarizes events in the art world for each year. As a result of this effort, the number of visitors to the website has significantly increased. In the presentation, OYAMADA made a comparison of the website designs before and after the improvement, and reported the effects of their new functions based on specific analysis results. TADOKORO made a presentation on the work of Gyokuyo KURIHARA (1883-1922), who had a successful career as a female painter in Tokyo in the Taisho period. Gyokuyo focused on painting under the theme of Christianity from 1918 to 1920. Among the works of art during the period, “Asazuma Sakura (Christian girl Asazuma with cherry blossoms),” presented at the 12th Bunten exhibition in 1918, is said to be one of her representative works. The painting visualizes a story that developed in the Edo period involving Asazuma, a prostitute at Yoshiwara, who was arrested for her Christian faith under the anti-Christian edicts and executed under cherry blossoms in full bloom as her dying wish. 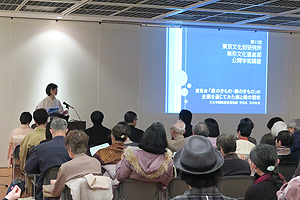 In his presentation, TADOKORO discussed Gyokuyo’s reason for painting “Asazuma Sakura” and the position of the painting in her works. He further gave an in-depth discussion of the significance of Christian art paintings for Gyokuyo. For the entire collection of Gyokuyo’s art works, please see TADOKORO’s other disquisition entitled “Initial Research on Gyokuyo KURIHARA” in The Bijutsu Kenkyu (The Journal of Art Studies) No. 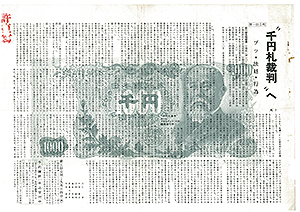 420 (issued in December 2016).